1. Build relationships with newcomers in our communities. Facilitate the mutual sharing of immigrants� stories and contributions in our churches and neighborhoods. 2. Plan congregational learning tours in our communities, including immigrant neighborhoods, churches, and workplaces, as well as government offices that serve immigrants. 3. Partner with immigrant congregations to plan church services or community events. 4. Offer church facilities and volunteers for documentation services, English classes, ethnic celebrations, or other outreach programs. 5. Engage in mutual aid to offer food, shelter, clothing, and other resources to undocumented and documented immigrants. 6. Learn about issues affecting immigrants by reading newspapers or magazines, joining national immigration rights organizations, or contacting church agencies that work with immigration issues. 7. Join study tours to the U.S./Mexico border, refugee camps, or detention centers to learn more about U.S. immigration and refugee policies. I've been keeping an eye on a couple new sites over the past month or so. The first is matt.org which stands for Mexicans and Americans Thinking Together. Some creative things are happening there including surveys;, articles and videos about Matt in the news; and information on a bilateral immigration forum to be held next week. Matt.org is a fully bilingual site, so encourage any monolingual Spanish-speakers to express their views on it. The second is the I Am A Proud American campaign. This campaign, in its early stages is gaining momentum and has developed a radio ad along with encouraging voter registration. Who would have been jailed if a gun had been left unsecured and the eight-year-old had used it? We don't even give driver's training until a child is 15 years old -- 17 years old in some cities. So why is an eight-year-old arrested for fiddling with the parking brake? He had no clue what he was doing. The tragedy in itself is devastating, but holding an eight-year-old responsible for an unsecured school bus is unthinkable. Even the victim's father has more mercy on this boy. May 24, 2006 � NEW YORK (AP) - The father of a second-grade girl killed when an empty school bus rolled forward and crushed her is asking for mercy for the eight-year-old boy accused of setting the vehicle in motion. Authorities say the boy, identified by the city's lawyers as Tafiri J., released the parking brake of the bus, causing it to roll and crush Amber Sadiq on Monday afternoon in Brooklyn. A judge has ordered a mental health evaluation for the boy. Amber's father, Imran Sadiq, says through a spokesman that Tafiri "is a baby himself" and that the question is why the vehicle wasn't more secure. What if could we set up something independent of elected government, something similar to the way the Federal Reserve is set up? An independent panel to set the immigration levels, how many of each visa class to issue each year, how many green cards etc. Think about it this way ... if we let elected officials set the fed interest rates they'd be 0% in election years, and 30% in off years, that's why they can't be trusted to do it. The same should be true with immigration. Between pressure from big business, the natural tendency of politicians to pander for votes and other political calculations, we would be better off if the basic nuts and bolts of immigration were handled by those whose only concern is both the well being of ALL the American people and the immigrants that want to join them. Talk about reform! And for more discussion with those seeking workable solutions, check out www.matt.org which stands for Mexicans and Americans Thinking Together. And we are in one of those times. I officially announce that I have lost all hope that good legislation might come out of the immigration reform debate. Senator Feinstein had it right today yet her ammendment was killed. The compromise bill that will likely pass the Senate on Thursday is infinitely flawed and I'm beginning to hope that it completely implodes in the house. It is as ridiculous as having laws on the books that allow for the arrest of eight-year-olds who do impulsive things with tragic results. I'm so sick of politicians oppressing the vulnerable for their own ambitions. Can someone please explain how this makes our country safer? Businesses with significant Hispanic immigrant clientele have been the targets of a canvassing campaign in Denver's north metro area. Friends arrived early one morning to find a flier taped to the door of their tortilleria. Considering the business is open from 7 A.M. to 7 P.M. Monday through Friday; 7 A.M. to 5 P.M. on Saturday and 7 A.M. to 3 P.M. on Sunday, you would think the info-thugs could have managed to come to the store at a time when they could held a personal dialogue with the owners regarding their concerns. It has come to our attention that many employers are hiring illegal alien labor. It is our duty to inform you that if you have employees of illegal migrant status, that you are, as of right now committing a Federal Crime (US Code TITLE 8, Chapter 12, Sub. 2, Part 9, 1234a). Many employers may not be aware that their employee's documents are FRAUDULENT. Illegal Aliens who present false I.D. to you are guilty of a FELONY. The sophistication of the documents is such that it could be difficult to identify the fake ones. We are giving you notice NOW, before your business incurs costly fines, confiscation of property and audits from the Federal and State governments. Not to mention the shame and loss of clientele that could come with public exposure of illegal hiring practices. We are therefore urging ALL businesses conducted within the US borders to immediately begin to implement the S.A.V.E. (Systematic Alien Verification for Entitlements) program. Under the Basic Pilot Program, employers can easily verify document claims for future hires. The program is FREE and available in all 50 states. US citizens and legal residents are becoming frustrated with the amount of illegal labor they are witnessing in this country. In the near future, do not be surprised if customers begin to inquire whether or not you are VERIFYING the immigration status of your hires! As more and more people become aware of this simple government program, there will no longer be an excuse for "accidentally" hiring those who are unlawfully here. Here is the information you need to protect your business. The SAVE Program enables Federal, state, and local government agencies and licensing bureaus to obtain immigration status information they need in order to determine a non-citizen applicant's eligibility for many public benefits. The SAVE Program also administers employment verification pilot programs that enable employers to quickly and easily verify the work authorization of their newly hired employees. Q. How do I join the Basic Pilot Program? Answer: Employers interested in joining the Basic Pilot Program must sign a Memorandum of Understanding (MOU) with the Social Security Administration and the U.S. Citizenship and Immigration Services' (USCIS) Systematic Alien Verification for Entitlements (SAVE) Program. On July 7, 2004, the SAVE Program began offering a Web-Based Access Method for the Basic Pilot. To register and complete a MOU for participation in the Basic Pilot go to https://www.vis-dhs.com/EmployerRegistration, and follow the instructions. Q. How much does it cost to participate in the Basic Pilot Program? Answer: There is no charge to the employer. The government provides the verification services at no cost to employers. Q. What equipment is needed to participate in the Basic Pilot? Answer: You will need a personal computer with access to the Internet. Q. What are the advantages for employers to volunteer to participate in the Basic Pilot Program? Answer: The Basic Pilot removes the guesswork from document review during the Form I-9 process; it allows the employer to confirm the employment eligibility of all newly hired employees; it improves the accuracy of wage and tax reporting; and it protects jobs for authorized workers. Q. Can I verify the work eligibility of all employees in my company? Answer: No, you may only verify the employment eligibility of employees hired after you signed the MOU. Q. When would I perform a verification query? Answer: You would perform the automated employment verification query after an employee has been hired, and the Form I-9 process complete. This automated query must be initiated within 3 business days of hire. It is important to remember that the system may not be used to pre-screen an applicant for employment. Q. Does participation in a pilot program eliminate the requirement of completing a Form I-9, Employment Eligibility Verification Form? Answer: No, Form I-9 requirements remain the same with the exception that all "List B" identity documents must contain a photograph. Q. Can I use the system to re-verify the employment eligibility of an employee whose employment eligibility document has expired? Answer: No, the system should not be used to re-verify employment eligibility. You would follow the procedures currently in place by completing Section 3 of the Form I-9. Q. Have steps been taken to safeguard individual privacy in connection with the pilot programs? Answer: Yes. The pilots are designed with safeguards to ensure that employer and employee information is protected. Q. If I join the program, am I obligated to participate in the pilot until it ends? Answer: No, if you join the program and decide that the pilot is not what you wanted or expected, you may drop out of the pilot. You would do this by sending written notice to the SAVE Program that you no longer want to participate in the pilot and give a brief explanation as to why. I laughed when 8 of Colorado's most extreme right-wing representatives sent a letter calling for Bush to "Call forth the Militia". It is hard to believe he is actually considering it. Just last year, Bush signed into law a plan to place thousands of Border Patrol agents on our Southern Border, but then provided for just 210 new agents in his budget proposal (source). On a gut level, I see this latest announcement as a manipulative move for both TV and approval ratings in addition to votes for the GOP in November. The nation has been worked up into a frenzy about immigration over the last year and the government has done nothing to dispel the many myths that have surfaced -- not the least of which being that placing troops at the border will fix broken policy. So, to put it simply, placing the guard on the border is like telling everyone to load up on duct tape: it will provide a lot of peace of mind, a false sense of security and accomplish little good. Salazar Gets Key Immigration Seat article from the Denver Post. 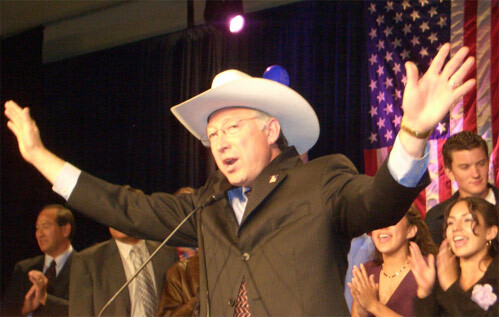 Sen. Ken Salazar is now a key player in the Congressional tug of war over immigration legislation. Senate Minority Leader Harry Reid, D-Nev., has asked Salazar, a Colorado Democrat, to sit on the committee that would unify any immigration bill the Senate passes with one the House passed last year. "It's an opportunity to work on one of the most pressing matters of national security for our country," Salazar said. It's an unusual opportunity for a freshman senator, one that will put him in what's likely to be a near war-room. Many House Republicans oppose any legislation that would grant legal status to illegal immigrants. Salazar has not yet sat on a conference committee. Members are normally appointed by seniority. Asked if he'd be willing to sacrifice the guest worker program and pathway to citizenship for a merged bill that just beefs up border security, Salazar demurred. "You can't deal with the issue of immigration in an effective way unless you do it in a comprehensive manner," he said. "Efforts on immigration reform that have been done by only looking at one part of it or another ... it didn't resolve the problem." Salazar, a 5th Generation Coloradan comes from a proud family which has farmed and ranched the San Luis Valley since before Colorado became a State. Colorado isn�t doing its residents a favor by conducting business in Spanish, says one Colorado Springs lawmaker. Rep. Dave Schultheis wants schools, libraries and state agencies to forgo bilingual instruction, reading materials and signage and stick to English. Schultheis, a Republican, maintains the state discourages people from learning English by providing information in Spanish. �We tend to be shifting our focus away from English,� he said. Well, this just leads to all sorts of irony. Like getting that pesky Spanish word "Colorado" off all signage like say, oh I dunno, the "Colorado State House of Representatives". It translates to: "Red State House of Representatives" -- wouldn't the GOP love that?! Or how about 18 of Colorado's 64 counties (all 18 formed over 100 years ago) needing to change their names? and Montezuma County (formed in 1889) would become... hmmm, looky there Mr. Schultheis, ain't no English word for Montezuma! Sure does look like all this focus shifting started a lot farther back than we think... from Spanish to English. Got one more Spanish word for ya... xenofobia and I'll bet we can all figure out how to translate that one. may be touched with your divine compassion. We pray in Jesus' name. Over the last few weeks, Senate in-boxes were getting hit with bricks (literally) and I imagine both parties were more focused on how to use this issue to their political advantage rather than on truly developing a solid policy. So, I'm still not convinced that either party is really in this for fixing a broken system, but they're moving ahead anyway and will hopefully have something ready by Memorial Day. In the meantime, human tragedy unfolds every day. Meanwhile, in Arizona, Sheriff Arpaio is applying his creative interpretation of a new state law and is jailing immigrants by the dozens with no intention of repatriating them to their home countries. His actions are being challenged in court in the coming weeks. With his interpretation of the new state law, these immigrants can be charged with a felony... something that federal lawmakers will not even do. So get on with it and get something passed that will prevent human tragedy and lone ranger sheriffs. It is time for comprehensive immigration reform. 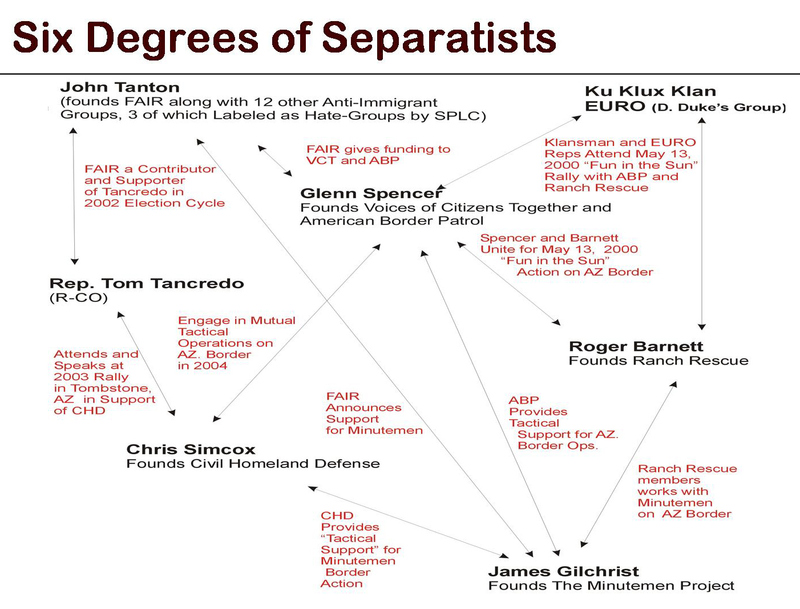 I found this helpful chart in a powerpoint by Bradford S. Jones of the University of Arizona... it is a great visual of the web between some of the most influential anti-immigrant extremists. Those organizations designated as hate groups by the Southern Poverty Law Center are marked with an asterisk (*). Why is my heart heavy? Because I've recently learned that a dear one may soon cross the Arizona desert in an attempt to re-enter this country. I cannot pretend to know God's mind on this, but ask Him to protect her and to reunite her family -- be it here or there. CABEZA PRIETA WILDLIFE REFUGE - Jerry Wofford studied a set of tiny footprints, no bigger than the palm of his hand, as a light wind swept across El Camino del Diablo, the Devil's Road. Wofford, a seasoned U.S. Border Patrol agent, can tell a lot from a footprint. If the weight falls on the ball of the foot, the migrant is running. A knee print, dragging a soft line in the sand, means he is crawling. Both of these are bad signs. As temperatures start to climb, Wofford is getting more and more apprehensive. To avoid more heavily patrolled stretches of Arizona border, more undocumented immigrants are crossing through this vast expanse of unpopulated desert east of Yuma, made up of thousands of square miles of sand, volcanic rock and stunted creosote bushes. Arrests in the Border Patrol's Yuma Sector are up nearly 15 percent from last year, and the death tally is already outpacing 2005, a record year. Agents in the remote corridor where Wofford patrols are reporting an 86 percent increase in arrests and are tracking smugglers and undocumented immigrants into increasingly isolated desert. When Wofford finds migrants out here, and they start to run and scatter, he hollers after them: "Where are you going? You're in the middle of nowhere, in the godforsaken desert!" Talk to folks from Madera, Chihuahua in Mexico and you will learn that the police warn the drug dealers prior to any federal raids... the city is squeaky clean by the time the raid gets there. The police wear far more jewelry and fine clothes than should be afforded on their meager state salary. Where do the funds come from? I'll give you a hint... it starts with Car and ends with tel. I met a gal last year whose husband had worked as a police officer in Mexico. She told me that she had prayed for a chance to come to the States because she knew her husband could not be a police officer and a Christian. The killings came a day after Guerrero state Governor Zeferino Torreblanca awarded Acapulco police 32 million pesos ($2.9 million) to buy guns, vehicles, and uniforms as part of a statewide crime-fighting package. In Guerrero, heavily armed enforcers for the Gulf cartel, dubbed the ''Zetas," are battling a group known as the ''Pelones," or ''Baldies," loyal to a drug gang from the western state of Sinaloa. Newspapers reported that the two murdered policemen belonged to a rapid response team that was involved in a shoot-out with a heavily armed drug gang in the La Garita district in January, in which four drug traffickers died. More than a dozen people have been gunned down in attacks attributed to organized crime in Acapulco this year. Earlier this month, five people were injured in a grenade attack in the city. In January 2005, Mexican President Vicente Fox declared an all-out war on drug gangs. Since then, more than 1,500 people have been shot, beaten, or suffocated to death by the drug gangs. Proponents note that current Mexican law already allows [drug] charges to be dropped if a person can prove that he or she is an addict. I'd swim the widest ocean and climb the highest mountain to get my kids out of there too. Are demonstrations of any use, some ask, when resistance is so unyielding? Would the slower processes of legislation and law enforcement ultimately accomplish greater results more painlessly? Demonstrations, experience has shown, are part of the process of stimulating legislation and law enforcement. The federal government reacts to events more quickly when a situation of conflict cries out for its intervention. Beyond this, demonstrations have a creative effect on the social and psychological climate that is not matched by the legislative process. Those who have lived under the corrosive humiliation of daily intimidation are imbued by demonstrations with a sense of courage and dignity that strengthens their personalities. But the above are not my words... they are the words of Martin Luther King Jr. in his article titled "Let Justice Roll Down" I think they lend great wisdom to these current days. I have tremendous admiration for those who have fought long and hard for racial equality (in this and in other countries). Many lost their lives and endured horrific beatings. Some must "see" or "read" movies and books on this topic are, the Eyes on the Prize video series, the Malcom X movie, the book A Different Mirror by Ronald Takaki and the Rabbit Proof Fence . As in the Civil Rights and other movements, time will reveal that this fight is about much more than policy. I've been following a story of unspeakable violence directed at a Texan teen. While shorter in length, this article paints an even more disturbing picture of the attack. We as the parents of Keith Turner are deeply saddened and sickened by the recent course of events. Our thoughts and prayers are with the victim and his family. We sincerely hope that a full recovery is made. We in no way condone or encourage the type of behavior that has taken place. In recent years Keith has had problems with drugs and violence. I assure you that we have not sat passively by and allowed this to happen without attempting to correct his choices. There have been attempts with counseling, medication and rehap. The unfortunate outcome is that he continued to make bad choices. We also did not feel that forcing him onto society to be dealt with was an option either. Our attemps were to keep that type of burden from happening. At this time we wanted to make everyone aware that this situation deeply concerns us. We are unable to make any public appearance due to the recent threats agatinst us, our family and our home. We wanted to make this statement in an attempt to convey our concern for all parties involved. We do still love our son, but do not accept this behavior. My heart was there (as was my spouse and many friends), but I had to stay behind. I was sad, but enjoyed watching the live streaming video from 9 News. I may be able to go to a prayer vigil later tonight. 9News of Denver -- report, slideshow and videos of the Denver march. An estimated 75,000 were there! Update: We had thought perhaps the Socialist Party would try to make the march today "their event". Unfortunately, their presence was too obvious and they did indeed try to hijack it. This is not something I support in any way and it is too bad. So far I have not seen anything in the media to this effect, but this is what I'm hearing from those who attended. Beyond having a smattering of people wearing red instead of white, some of the speakers had a socialist bent. I hope the true message at the core of this doesn't get diluted by this fringe group.